MY NAME, "GERARD VAN DER LEUN," IS AN UNUSUAL ONE. So unusual, I've never met anyone else with the same name. I do know of one other man with the name, but we've never met. I've seen his name in an unusual place. This is the story of how that happened. It was an August Sunday in New York City in 1975. I'd decided to bicycle from my apartment on East 86th and York to Battery Park at the southern tip of the island. I'd nothing else to do and, since I hadn't been to the park since moving to the city in 1974, it seemed like a destination that would be interesting. Just how interesting, I had no way of knowing when I left. August Sundays in New York can be the best times for the city. The psychotherapists are all on vacation -- as are their clients and most of the other professional classes. The city seems almost deserted, the traffic light and, as you move down into Wall Street and the surrounding areas, it becomes virtually non-existent. On a bicycle you own the streets that form the bottom of the narrow canyons of buildings where, even at mid-day, it is still cool with shade. Then you emerge from the streets into the bright open space at Battery Park. Tourists are lining up for Ellis Island and the Statue of Liberty. A few people are coming and going from the Staten Island Ferry terminal. There are some scattered clots of people on the lawns of Battery Park. Everything is lazy and unhurried. I'd coasted most of the way down to the Battery that day since, even though it appears to be flat, there is a very slight north to south slope in Manhattan. I arrived only a bit hungry and thirsty and got one of the dubious Sabaretts hot dogs and a chilled coke from the only vendor working the park. The twin towers loomed over everything, thought of, if they were thought of at all, as an irritation in that they blocked off so much of the sky. It was 1975 and, Vietnam not withstanding, America was just about at the midway point between two world wars. Of course, we didn't know that at the time. The only war we knew of was the Second World War and the background humm of the Cold War. It was a summer Sunday and we were in the midst of what now can be seen as "The Long Peace." 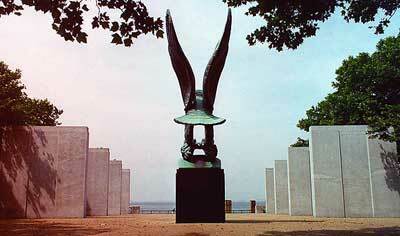 In front of the lawns at Battery Park was a monument that caught my attention. It was formed of an immense stone eagle and two parallel rows of granite monoliths about 20 feet wide, 20 feet tall and 3 feet thick. From a distance you could see that they had words carved into them from top to bottom. There was also a lot of shade between them so I took my hot dog and my coke and wheeled my bike over, sitting down at random among the monoliths. I remember that the stone was cool against my back as I sat there looking at the stone across from me on that warm afternoon. As I looked up it dawned on me that the words cut into the stones were all names. Just names. The names of soldiers, sailors and airmen who had met their death in the north Atlantic in WWII. I was to learn later that there were 4,601 names. All lost in the frigid waters, all without any marker for their graves -- except those in the hearts of those they left behind, and their names carved into these stones that rose up around me. I read across several rows, moving right to left, then down a row, and then right to left. I got to the end of the sixth row and went back to the beginning of the seventh row. At the beginning of the seventh row, I read the name: "Gerard Van der Leun." My name. Cut into the stone amongst a tally of the dead. If you have an unusual name, there's nothing that prepares you for seeing it in a list of the dead on a summer Sunday afternoon in Battery Park in 1975. I don't really remember the feeling except to know that, for many long moments, I became chilled. When that passed, I knew why my name was in the stone. I'd always known why, but I'd never known about the stone or the names cut into it. "Gerard Van der Leun" was, of course, not me. He was someone else entirely. Someone who had been born, lived, and died before I was even conceived. He was my father's middle brother. He was what my family had given to stop Fascism, Totalitarianism and Genocide in the Second World War. He was one of their three sons. He was dead before he was 22 years old. His body never recovered, the exact time and place of his death over the Atlantic, unknown. As the first child born after his death, I was given his name, Gerard. But as a child I was never called by that name. I was always called "Jerry." "Jerry" is not a diminutive of "Gerard." There are none for that name. But "Jerry" I would be because the mere mention of the name "Gerard" was enough to send my grandmother into a dark state of mind that would last for weeks. This was true, as far as I know, for all the days of her life and she lived well into her 80s. My grandfather could barely speak of Gerard and, being Dutch, his sullen reticence let all of us know very early that it was wrong to ask. My father, who was refused service in the Second World War due to a bout with rheumatic fever as a child that left him with the heart murmur that would kill him shortly after turning 50, was ashamed he didn't fight and wouldn't speak of his brother, Gerard, except to say "He was a great, brave kid." My uncle, the baby of the family, spent a year or two of his youth freezing on the Inchon peninsula in Korea and seeing the worst of that war first hand. He was my only living relative who'd been in a war. He would never speak of his war at all, but it must have been very bad indeed. I know this because, when I was a teenager, I was out in his garage one day and, opening a drawer, I found an old packet of photographs, grimy with dust at the back under a bunch of rusted tools. The black and white photos with rough perforated edges showed some very disturbing things: a helmet shot full of holes; a boot with most of a leg still in it, some crumpled heaps of clothing on patches of dirty snow that proved to be, on closer inspection, dead Korean soldiers; a pile of bodies on a snowbank with black patches of blood seeping into it. The full horror show. He had taken them and couldn't part with them. At the same time he couldn't look at them. So he shoved them into a drawer with other unused junk from his past and left it at that. He never spoke of Korea except to say it was "rough," and, now that he lives but has quit speaking of anything, he never will. His only comment to me about his brother Gerard echoed that of my father, "He was a great kid. You can be proud to have his name. Just don't use it around Grandma." And I didn't. No one in my family ever did. All through the years that I was growing up at home, I was "Jerry." This attitude served me well enough and soon it seemed I had trained my bothers and my parents in my new name. Of course, I'd taken this name not because of who my uncle had been or because of the cause for which he gave his life, but for the selfish reason that it simply sounded more "dignified" to my ears. I was a student at the University of California at Berkeley and it was 1965 and we had no truck with the US military that was "brutally repressing" the people of Vietnam. We were stupid and young and nothing that has happened at Berkeley since then has changed the youth and stupidity of its students. If anything, my era at the University just made it somehow possible for Berkeley students to think that their attitudes were as noble and as pure in their minds as they were stupid and selfish in reality. I was no longer a "Jerry" but a "Gerard" and I was going to make the world safe from America. At some point during the meal, my grandmother said something like, "Would you like some more creamed onions, Jerry?" And because I was a very selfish and stupid young man, I looked at her and said, "Grandma, everyone here knows that I'm not Jerry any longer. I'm Gerard and you've just got to get used to calling me that." Nobody moved. Very slowly every set of eyes of my family came around and looked at me. Not angry, but just looking. At me. The silence went on. Then my grandmother, whose eyes were wet, rose from the table and said, "No. I can't do that. I just can't." She left the table and walked down the hallway to her bedroom and closed the door behind her. The silence compounded itself until my grandfather rose from his chair and walked to the middle of the hallway. He took a framed photograph off the wall where hung next to a framed gold star. It had been in that place so long that I'd stopped seeing it. My grandfather walked back to the table and very gently handed me the photograph. It show a smooth-faced handsome young flyer with an open smile. 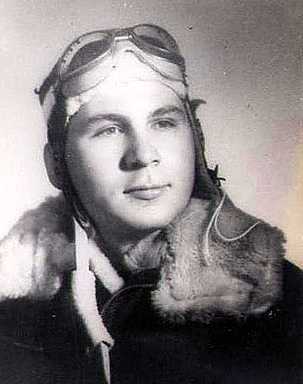 He was dressed in fleece-lined leather flying jacket and leaning casually against the fuselage of a bomber. You could see the clear plastic in the nose of the plane just above his head to his right. On the picture, was the inscription: "Folks, Here's my new office! Gerard." My grandfather stood behind me as I looked at the picture. "You are not Gerard. You just have his name, but you are not him. That's my son. That's Gerard. If you don't mind, we will continue to call you Jerry in this house. If you do mind, you don't have to come here any more." Then he took the picture away and put it back in its place on the wall. He knocked on the bedroom door, went in, and in a few minutes he and my grandmother came back to the table. Nobody else had said a word. We'd just sat there. I was wishing to be just about anyplace else in the world than where I was. They sat down and my grandmother said, "So, Jerry, would you like some more creamed onions?" I nodded, they were passed and the meal went on. My parents never said a word. Not then and not after. And, to their credit, they continued to call me Gerard. But not at my grandparents' house. 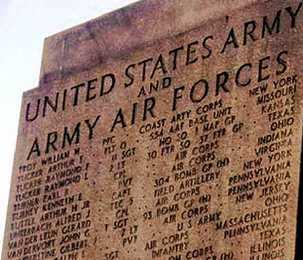 In 1975, I sat against a monument in Battery Park in New York and read a name cut into stone among a list of the dead. That long ago Thanksgiving scene came back to me in all its dreadful detail. I tried to understand what that name in the stone had meant to my family when it became the only thing that remained of their middle son; a man who'd been swallowed up in the Atlantic during a war that finished before I drew breath. I tried to understand what it meant, but I could not. I was a child of the long peace who had avoided his war and gone on to make a life that, in many ways, was spent taking-down the things that my namesake had given his life to preserve. These days it makes me feel cheap and contemptible to think of the things I did to point out all the ways in which this country fails to achieve some fantasied perfection. I was a small part of promulgating a great wrong and a large lie for a long time, and I'm sure there's no making up for that. My chance to be worthy of the man in the photograph, the name on the wall, has long since passed and all I can do is to try, in some way, to make what small amends I can. Remembering these long ago moments now as we linger on the cusp of the Long War, I still cannot claim to understand the deep sense of duty and the strong feeling of honor that drove men like the uncle I've never known to sacrifice themselves. Lately though, as we move deeper into the Fourth World War, I think that, at last, I can somehow dimly see the outlines of what it was. And that, for now, will have to do. Since finding his name on the stone in 1975, I've been back to that place a number of times. I once took my daughter, Justine Van der Leun, there, but she is much more spoiled than I had been. She didn't get it, was quickly bored. After September 11th, I made a point of going to the monument as soon as the way was cleared, sometime in 2002. It was for the last time. But if you go the monument, you can see the name in the stone. It's not my name, but the name of man much better than most of us. It's on the far left column on the third stone in on the right side of the monument looking towards the sea. The name is usually in shadow and almost impossible to photograph. Like most of the other names carved into the stone it's up there very high. You can see it, but you can't touch it. I don't care who you are, you're not that tall. Note: Since this essay was first written in May, 2003, several thoughtful people have supplied me with photographs. As you can see, the name still remains difficult to photograph. I also have found and reproduce here a photograph of the real Gerard Van der Leun, as he was and as he shall remain. The Name in the Stone. Click to enlarge. A beautiful and very moving post. The orininal posting of this was the first of your entries I read, linked to it by Glenn Reynolds. I am of your generation, and was a student at San Francisco State when you were at Berkeley. Every year I read this, my reaction is the same. It is quite wonderful. I look forward to reading it next year. While poking around in your archives a couple of days ago, I randomly hit May, 2003 without really thinking that Memorial day was right around the corner. The picture of the eagle between stone monuments was striking so I read, and was moved to remembering that indeed, Memorial day is here and deserves some quiet contemplation. My mood of reflection was shaken somewhat upon recieving an email from my mother linking to a Sheehanesque rant by a gold star mother hysterically blaming her sons death in Iraq on all the usual leftist suspects. Bush, Republicans, Haliburton, big oil, yada, yada, yada. In the comments on your post on Bad Thoughts, I touched briefly on my mothers gradual tranformation from JFK Democrat to a wearer of the tin foil hat upon our move to Seattle in 1967. It was interesting to me that you found the comment "startling" as it seemed while I was hitting the keys just a hopefully mildly amusing anecdote of street fair moonbattery and growing up in the sixties. Looking at my comment again I suppose it is a bit startling. Startling in how my mother, a good caring gentle woman, who instilled in me all of the classically liberal values that made your essay "The Name In The Stone" so moving to me, could be equally as moved by an essay referring to our soldiers, on Memorial Day, as mercenaries for Bushco. How is it that good people, on this day, would preach tolerance for those who would destroy us and reserve the harshest judgement for those who have sacrificed everything to protect us? Thank you. In some ways the "blogosphere" cheapens words, because there are now so many of them. That was an article that should have been published nationally: Harpers or Atlantic or even The New Yorker. It is my great good fortune to have found it anyway. "Marine Cpl. Stephen R. Bixler was carried last week from his family church in Suffield, Connecticut, en route to his final resting place at Arlington National Cemetery. "His platoon commander, 1st Lt. Nicholas Lodestro, says Stephen was 'loyal, knowledgeable and dedicated. He was a warrior I felt comfortable to serve with. He was the man in front protecting us. He was a dedicated, unselfish, charismatic warrior.'" "His battalion commander, Lt. Col. James Bright, said of this young Marine, 'He died fearlessly leading and willingly sacrificing his own safety for those around him.'" "'Do not squander the time given to you by God or the freedom preserved by this Marine's life.'" How old was Justine at the time? I suspect her attitude had a lot to do with her age at the time, plus the context of the experience insofar as she was raised in a different world than you were. Thanks for re-posting this article. I hadn't had the privilege of reading it before. Once again you lay it all on the line for us, which is why I peruse your site so often. I did have the privilege of being at that monument in Battery Park. The monument truly moved me. The Manhattanites who "never get the chance" to see it are the one's we have to worry about. I once brought my kids to Arlington National Cemetery. I wanted them to experience the place and I also wanted to visit the grave site of a high school friend of mine. He had been a Marine named Stephen Crowley who was killed in 1979 defending our embassy in Islamabad, Pakistan. It had been attacked during the time our embassy in Tehran was seized by our enemies, the Islamo-fascists. The Islamos have been killing us for a while now. There must be a way the left can finger Bush for that day, too! I got quite pissed off at my kids when they both acted as though I was torturing them by making them be there. I was quite disappointed. Thank God I can tell you "the rest of the story"... my son served two years active duty and my daughter served in combat in Iraq before being accepted to West Point where she is just finishing up her plebe (freshman)year. They are both patriots and I'm very proud of them. Gerard, I'm sorry you never got to meet your namesake. I can tell you that his nephew has matured into a patriot whom I'm glad to call a fellow American. Perhaps we Americans will once again be able to bring liberty to a place that desperately needs it, even without the help from our liberal friends. Have a safe Memorial Day weekend, and if you get the chance remember Marine Lance Corporal Steven Crowley. That was amazing...thank you for writing it! I've read this post before but it touches me each time very deeply. My USMC dad served on Iwo, at Korea, on Okinawa, in Viet Nam. I thought it was cool to protest in the 60's. How I cringe now at how ignorant I was. Happily I think Dad understands I was silly and young and after Saving Private Ryan we had lots of talks about his war experiences I cherish. This summer I am studying in Europe and will make a short trip to Bayeux in Normandy to tour the landing beaches-and he is tickled to death. Which is, of course, why I am doing it. There was a time during the 1980’s and 1990's when business frequently brought me to D.C. I would invariably, and at times not of my own free will, take a walk down Constitution Avenue and visit the “Wall”. Always the same cold black granite. Always the visitors, keepers of the memories, with fingers brushing tenderly across a name. A prayer here, a sob there. A name out of reach to many. All ages, all colors…all somber in their thoughts. A whispered conversation here or there. The comfort of an arm over a shoulder. A knowing empathetic pat. The locations of the inscriptions I visited were memorized. So much life, so many memories reduced to inscriptions on a cold black granite wall. And my fingers ask….What’s happening Billie? Hey Den…..Are there G.T.O.’s in heaven? Do you remember the time, “Kats”? And on and on. We were much, much more than friends and brothers. And I always cry. Thank you for this beautiful post. I came here via One for the Road, Richmond. Thank you to Gerard the first. And your family. Your words have deeply moved me, as have the comments of my fellow patriots. This Memorial Day I'm reminded of a good friend, LCDR Kelvin Fujimo, a Navy dentist, who died from AIDS, contracted from a patient he was helping. He continued to work on AIDS patients, after he was medically retired from the Navy, often working 12 hour days, until he could no longer work, and was hospitalized. He died serving his country and doing what he loved; helping people. Gerard, I've read this a few times. To me it expresses reverence to the memory of all our fallen warriors, and their families. And each time I have trouble seeing the screen by the time I'm finished. This is my first time reading your post,and it just warmed my heart,and it was a reminder of what our predecessors did for us,but,sadly this generation is so weak we are doing the very oppositeMy dad was a Nam vet and I had planned to follow in his footsteps,but,sadly,ended up with a health issue!Boy,and it makes me respect what my father and the men he fought with were trying to do,and the left undermined that and actually their stupidity,and wimpyness is what has gotten us in this mess now,so I don't care to here anything wimps have to say,I'd rather listen to the grownups such as yourself! Of all your good essays, this is my favorite. I was visiting NYC a couple of summers back with my daughter who is going to graduate school in NY. We had just come out of the Staten Island Ferry building going to see if we could get to the Statue of Liberty, when I saw the eagle in the distance and knew immediately what I was seeing. I tried to find your uncle's name but didn't know where to look. I had two uncles in WWII, both of whom survived. When visiting one of them as a child in the early fifties, I was intrigued by his homemade ashtray made out of the base of a 3 or 4 inch shell casing. While talking with him about it, I noticed an ugly piece of distorted metal about 2" long, 1" wide, and 0.5" deep. It was curved, heavy with jagged edges, with striations & cracks in the surface. I asked him what it was and where he had got it. He told me it was a piece of shrapnel and that he had gotten it off the deck of a ship during the war. He then went on to explain that he was an electrician's mate in the Navy and was stationed for a time at a port somewhere in North Africa fixing ships. He was often in the bowels of a ship repairing damage and could hear the sounds of bombs exploding transmitted through the water. No one dared go on deck because so much debris from the anti-aircraft fire was pattering down. He said it sounded like a steady rain clanging on the deck above. This fragment was a piece he had later recovered. As I grew older, I came to appreciate the fear that these men must have experienced. To be working below the waterline of a ship in an enclosed space and to hear the sounds of explosions and know that at any moment the ship you were on might be hit! Yet he and thousands like him "soldiered" on, doing what had to be done. I have never been similarly tested and I can only hope that I could rise to the occasion as they did. We owe them, and the men of every generation who protected this country, a debt we can only repay by being willing to make a similar sacrifice. Thank you for this Memorial day remembrance. So much was given by those who have gone before us - we need to remember. My Dad was in WW1 and my brother in WW2. Some paid such a dear price and we take so much for granted. Thank you for reminding me of the cost of freedom. Bless you this Memorial Day. I think I've seen this everytime since you first posted it. It does not fail to move me every time I read it. wow, thank you for sharing that story. Excellent post. Thank you for sharing something so personal and poignant. Quite apart from the content of your recollection, while the image of the engraved name is a bit soft, to my knowledge there never was any rank "GN" in the US military. Look carefully again, and you'll see that it says "CPL", for corporal. grace of growing up during the long peace. last safe and all war was possible to avoid. How sad, silly, and stupid of us all. many are not capable of facing that fact. Thank you for such a wonderful essay. I look forward to, and make a point of, reading it every Memorial Day. I also encourage friends, relatives, everyone I can, to read it. I wish to have my name in the comments on the post about the stone with the name of the uncle in the war for the freedom of the world at a time when to die during battle in heroic ways under God for liberty and justice resulted in deep appreciation from all people in those days. It may be that the error of George Bush was not in going to war; it was in attacking the wrong target, and then not attacking vigorously enough. Saddam Hussein was indeed a monster, but not one that threatened the West; in fact he suppressed Al Qaeda, very savagely indeed. The real culprit was Saudi Arabia, with some help from Iran, and still is. What should have been done? Simple. Secure the Saudi oilfields and destroy everything else, especially in Mecca, so that not one stone stood atop another - destroy every factory, power plant, school, college, water treatment plant and everything else required for a modern society. At the same time, freeze all Saudi assets permanently. And then see how they like living in the Dark Ages they hark back to. But it wasn't done, and a steady trickle (by WWII standards) of American and British blood and a cataract of our money continues to be soaked up by the sands of Iraq. Iraq isn't worth the life of one Allied soldier.